Conor Grant, who impressed so many during pre-season 12 months ago, has already made a strong impact this time around. A serious back injury during last season scuppered any chance of a breakthrough into the first team, but the local boy will hope to catch the eye of Roberto Martinez during the next few weeks. John Stones set the standard for all of Everton’s youngsters to follow and Grant has already demonstrated a maturity that suggests he is ready to push for a place in the Everton midfield. A cultured player, comfortable in possession and with an eye for a pass, Grant is ideally suited to the School of Science. His exquisite goal in training, which was captured by the EvertonTV cameras, will have certainly grabbed the attention of Evertonians around the world, but it was an interview with the Liverpool Echo at the end of last season which offered an insight into his hunger to make an impact on Martinez ahead of the new season. “It’s a big year for me now and I’m looking forward to it. Hopefully I can play more of a part in pre-season and get a bit of game time and prove what I can do. “I’m an Evertonian so I’m delighted we’re in Europe, but as a player that hopefully gives me and the other lads a chance to get game time. You want any chance that can come. It’s a great competition to be in and I’m sure all the lads are ready. “The rewards are there and they’re so great. 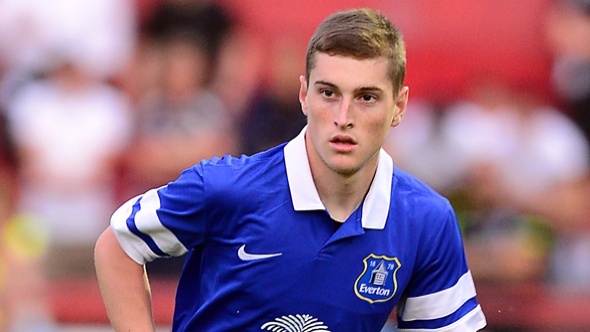 For staying disciplined, to get the chance to play for Everton – it’s not even a question, you just do it.